But if the Fender American Acoustasonic Telecaster had been around when Bob was breaking hearts and blowing minds back in ’66, he would have been able to play both the acoustic and electric portions of his concert on the same guitar. Flip the switch forward to get the forceful bass of a big, spruce-top dreadnought acoustic. Move it into the middle to find the fingerstyle-friendly midrange tones of a small-bodied mahogany guitar, or the propulsive drive you’d get from a flat-top acoustic with a hot pickup in it. Push the selector switch all the way back and you can even make the thing sound pretty close to an electric guitar. The ability to blend the various sounds together is the Acoustasonic’s best feature. Not only does it give the instrument a tremendous sonic palette, but I found the most interesting stuff tends to happen not with the blend knob dialed all the way to one side or the other, but somewhere in the middle. Purists will scoff at the Acoustasonic as a soulless digital abomination, and that’s fine. This sort of 21st-century machine is never going to be for everyone. I will say that the feel of the instrument is excellent. It’s set up like an acoustic guitar (complete with a wound G string), but the small Tele body and slim neck make it much easier to noodle around on than your typical big box. Still, it’s meant to be plugged in. It has the character of an acoustic guitar when you strum it unplugged, but it doesn’t come close to filling a room or drawing forth rivers of human tears the way a real-deal acoustic does. It’s the same on the other end. 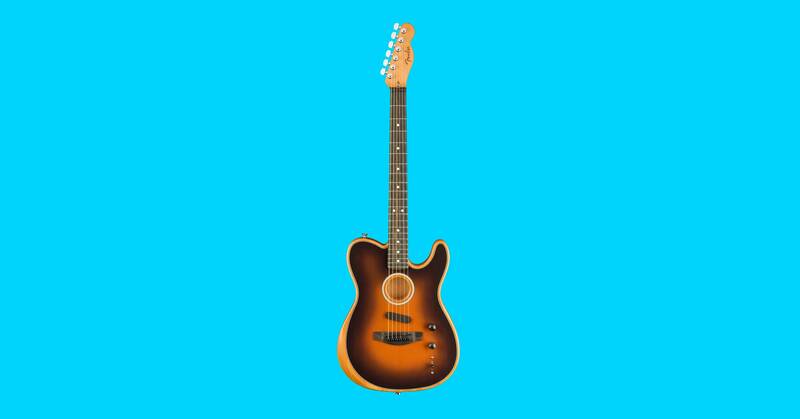 The “electric” voices in the Acoustasonic sound nothing like an actual Telecaster, but they do make it sound more like an electric guitar than an acoustic guitar—an impressive feat anyway. The idea is that if you’re an artist who treasures sonic variety, you can just buy one of these guitars (which lists for $2,000 by the way) and play it all night instead of switching guitars between every song. I would argue that people who switch guitars multiple times during a show are cool. That’s a very cool move, pulling out some shiny vintage showpiece for this song, then another for that song. The Acoustasonic negates that cool factor. But since you can’t buy cool, why not just buy convenience?